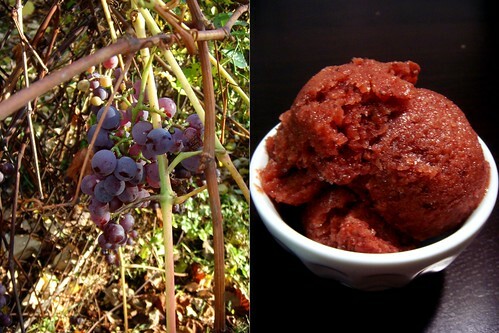 urban yield: concord grape sorbet, originally uploaded by aarn! +9th January, 2009+. in the same harvest that brought the concord grape jam, trisha decided to attempt to make a grape sorbet, and the result was a deliciously light and fresh tasting treat (too bad that it was november and not august). 4-lbs of grapes (rinsed and stemmed) and 1c. of water were blended and put over low heat in a sauce pan. 3/4c. sugar and 1T. vodka were added to the warm pulp, and stirred until the sugar had dissolved. i think that the mixture was transferred to a mixing bowl, stirred over an ice bath for a little while until slightly chilled, then moved to the freezer. while in the freezer, the blended grape mixture was removed and stirred every 30-45 minutes for 2-3hrs, until at the desired consistency. in the future probably would have used a combination of a food mill and some other process to remove the seeds (while keeping the skin). to use after it was frozen solid, it was put out at room temperature for an hour or so.